How To Create More Success, Blast Through More Problems, And Enjoy Even More Profound Results. Are you using PSTEC on a regular basis? Then let me tell you about the PSTEC Accelerators. PSTEC is extremely powerful. You’ve probably found that out for yourself already. The various PSTEC tracks amaze most people who use them but even so, Tim has figured out ways to increase the power even more. That’s the purpose of the PSTEC Accelerator tracks: To “ramp up” the power of every other PSTEC track. When should you use these? PSTEC is not just about getting rid of a phobia and moving on because you can use PSTEC to improve every single aspect of life. 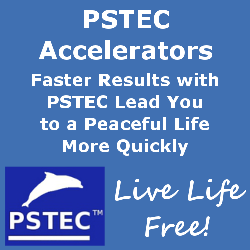 More people are reporting huge personal and emotional benefits of using PSTEC on a regular basis. Because many people are already using PSTEC regularly, you may already have realized that you can use the PSTEC click tracks to work through all the emotional garbage you ever accumulated. Using PSTEC in the longer term is simply life changing. It’s for longer term use of PSTEC that the Accelerators are an absolute must because they are carefully designed to give better and more profound results in less time. Tim has been using accelerator tracks in his private practice for several years. Now, finally, you can use them too to get even better results, faster. As well as speeding the results of longer term use, the Accelerators are also designed to make the beneficial change deeper and more profound.